Scott Thomas is my kind of writer. I have a particular fondness for quiet, atmospheric fiction: stories that rely on suggestion instead of an overload of exposition. I enjoy fiction that allows me to participate in the story, to give me the freedom to fill the dark places with my own horrors. When I find that quality in an author, that ability to evoke unease solely through implication, there’s nothing better. Over the Darkening Fields has that quality, but it also has so much more. In true weird fiction fashion, it is the hint of horror that is most disconcerting. To me, that is a sure sign of a writer confident in their abilities. Throughout this collection, Scott trusts us to draw our own conclusions, letting us place our ear against a door to decide for ourselves if there is anything waiting on the other side. Very often, there is. While I am tempted to give my impression of each story – and believe me, every tale is absolutely worth your time – part of the joy of reading this collection involves not knowing what to expect beforehand. Too much detail would be a disservice to both the stories and your experience, so instead I’ll simply mention a few to give you a small taste. The House of Murals opens the collection, a story that does a fantastic job of introducing you to Scott’s use of description and delicate word-choice. This story also gives you an excellent sense of his fondness for architecture and antiquity. It is a wonderfully strange tale about disconnection and loneliness, and a man with a peculiar fondness for visiting an old house late at night. A Certain Gravity is a thoughtful story about horror that lurks beneath the surface. It has a Twilight Zone-esque feel to it, utilizing the shows strangeness without mimicking its usual dramatic endings. Every event in the story leads to a climax that, while surreal, feels oddly applicable to contemporary perceptions of gender and beauty. The final story I’d like to mention is The Girl in the Attic, and for a very specific reason. Up to this point, I’ve commented on Scott’s use of subtlety to communicate his unique brand of quiet horror. This story on the other hand uses a very different approach, one that relies on a quick pace and a heightened focus on physical horror. The writing style is intentionally less languid here, and Scott enters some pretty dark territory. While it does diverge from his usual slow-burn method of storytelling, it in no way feels out of place in the collection. In fact, I’d say it serves as a great example of his ability to shift gears depending on what the story calls for. When it comes to writing ability Scott is a natural. He knows how to construct a beautiful sentence, and does so only in service to the story. On several occasions I re-read entire paragraphs in an attempt to glean just how he pulled something off so eloquently. One gets the feeling that Scott is very meticulous about his word-choice, or perhaps he simply plucks poetic phrasings from the ether while he dreams. Neither would surprise me. I think what I find most alluring about Scott’s work is how focused it is on communicating his deep affection for autumn. 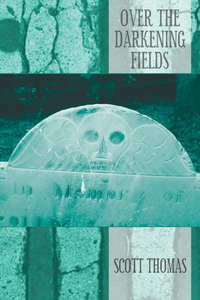 Many of the stories in this collection occur during the fall months, yet not once does that feel tedious or overused. Instead, it allows the reader to glimpse the many facets of the season, proving there is still much fertile ground to be explored when coupling autumn with the weird tale. I can think of no other writer who even comes close to painting the beauty and mystery of the season on a page. With a confident yet unassuming voice, Scott masterfully articulates his love for nature and the inevitable change of seasons. This collection is an invitation to wander old forest paths, to listen to the voice of the wind on barren branches, to step gingerly through puddles of fading autumn light. It is a gathering of stories that celebrate the warmth of tradition and the deep mystery that lingers wherever shadows touch the ground. Thank you for this lovely review, Clint!